The Penn Museum is unwrapping the mystery of mummy conservation, giving the public an unusual close-up of researchers' efforts to preserve relics from ancient Egypt. 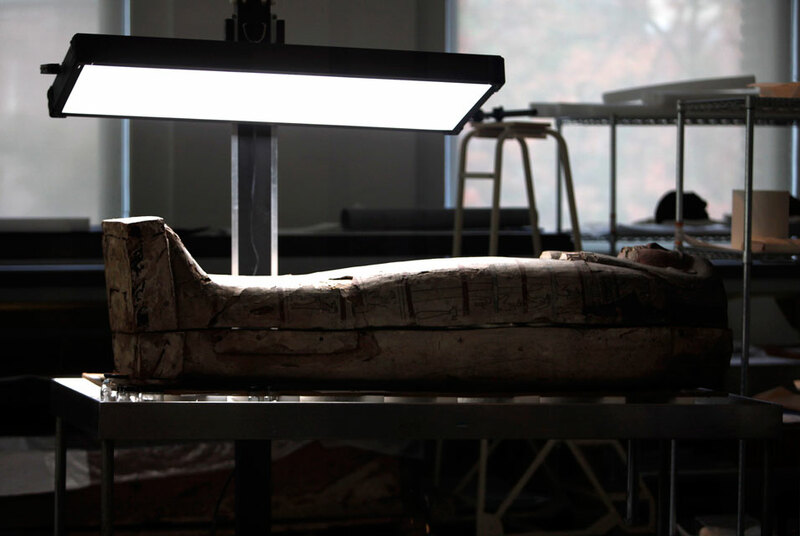 Human and animal mummies, as well as an intricately inscribed coffin, are among the items undergoing treatment and repair at the Philadelphia institution's newly installed Artifact Lab. Housed in a special gallery, the glass-enclosed workspace lets visitors share in "the thrill of discovery," museum director Julian Siggers said. "It demonstrates to you the work that's actually being done behind the walls of these galleries," Siggers said. Visitors can watch staff members use microscopes, brushes and other tools of the trade to inspect, study and preserve items including the mummy of a 5-year-old girl, several human heads, a colorful but damaged sarcophagus, and a painting from a tomb wall. Flat-screen monitors display magnified views of the relics as they are being examined. Conservators will also set aside time twice a day to answer questions from the public. The archaeology and anthropology museum has identified 30 objects from its 42,000-piece Egyptian collection to be conserved during the evolving project. Many of the lab items have not been exhibited before because of their poor condition, said conservator Molly Gleeson. Among Gleeson's first projects are preserving the mummies of a cat, falcon and ibis. She described the falcon's linen wrappings as frayed and powdery, and noted its precariously attached head would need to be stabilized before the mummy could be displayed. Also undergoing study are hieroglyphic-inscribed slabs of wood that comprised the coffin of an Egyptian named Ahanakht, circa 2000 B.C. "Conservation efforts led researchers to discover hidden inscriptions on the seams", said David Silverman, curator-in-charge of the Egyptian section. Head conservator Lynn Grant said staff members continuously experience a sense of wonder as they work with historical artifacts. "It is a delight, with this new space, to be able to share that with our visitors and give people an idea of what's going on behind the scenes," Grant said.